Welcome to my Boeing 737-900 Cockpit building website. Since a very young age, I have been facinated with Aviation. Later in time, when I've reached the age of 16, I could start with my training on sailplanes. But, unfortunately, I had to interrupt the training for focussing on higher education. As time passed and I started working in the informatics branche, I've lost the track for aviation. As they say that it's kind of addictive, I didn't want to return to sailplanes, but take it a step up. So, I decided to start building a flight simulator (737-900NG) on real scale. This was easier said than done. Where do I start, what do I need, what's out there, etc. And of course, WHAT DOES IT COST!. After performing some research for a while, I found the suppilier for my parts. 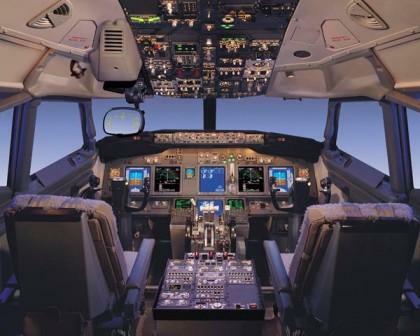 FlightDeck Solutions in Canada. I went on to define the budget available and all additional material like projectors, screens, construction materials, etc. I quickly came to the conclusion that the primary question, what does it cost, wasn't enough. I needed to rephrase it to HOW FAR WILL I GO AND WHAT DOES IT COST!. I also came to the conclusion that this wasn't going to be a project of 1 to 2 years, but longer. So far, every question that I've posed and awnsered, was as expected. Ok, almost. But it was very close. So the advice I want to give to fellow builders out there is that planning is the key to success! But one thing that is needed to prioritize in the planning is buy/build as you fly. In other words, Build and integrate so you can continue flying. It makes no sense to start building and not flying anymore. You'll lose the feel and touch! What can you expect on this website. On this site you can follow the progress of my cockpit. There is a library section where you can download configuration documents, configuration files, tips & tricks, etc. A page per section (Aft Overhead, Overhead, MIP, Pedestal, Throttle, etc...) will be/is added as well providing more in depth info, pictures and so on. I hope the information you will find here can be of any assistance in your cockpit project. And remember: "What goes up, must eventually come down." Finally got some spare time again and I've started to improve the cockpit. Further I took the opportunity to extend the web site. I've activate the Overhead, Pedestal and Throtlle pages. I already have them for some while and it's about time to add some images and usefull information like configuration, setup etc. I hope you will find them useful. The Pedestal has been delivered today. Looks realy superb!!! I'll shortly activate and update the Pedestal page. Picutres added to Photo Gallery. I've received confirmation that the pedestal is almost ready to ship. Just finalizing the payments and on its way it is. Can't wait to get it installed! It has been while for updating the site, but I was busy putting it all toghter in the shell. I'm doing some wiring (and hide them off course). Once finished, I'll post some pictures. And to make it even more real, a dual 737 flap gause is on its way and will be installed in the coming days.